A neighborhood organization called Our Mission No Eviction has asked the Planning Commission for a discretionary review of 1924 Mission St. near 15th Street, where developers are proposing a seven-story mixed-use building with 11 housing units over ground floor trade shop and retail space. 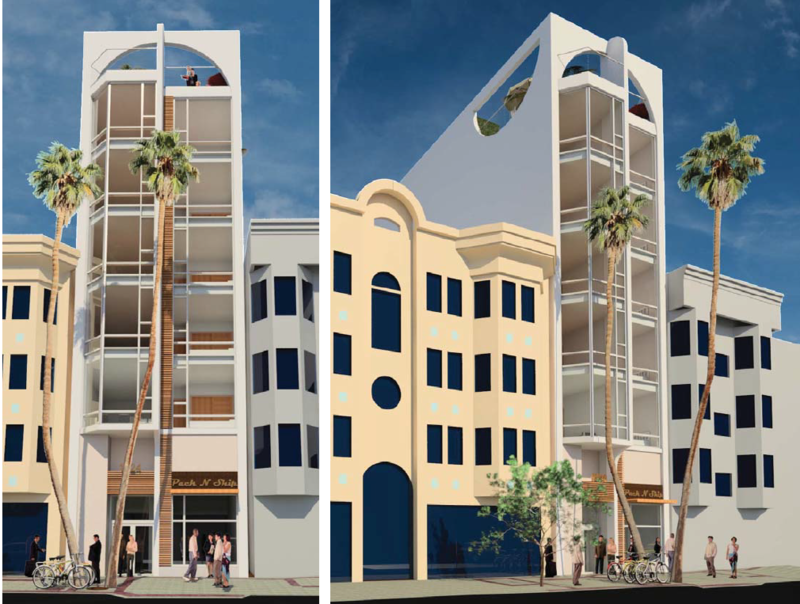 The request makes reference to the proposed building’s near-identical neighbor two doors down, at 1900 Mission St., where commissioners requested changes to the building’s design, implying that its earlier appearance was too upscale for the neighborhood. After several continuances, that project, with revisions, will return again to the commission in June – about nine months after the request for review was first filed. Both proposals call for the demolition of single-story auto body shops to build multiple stories of housing over a retail ground floor. Both were proposed more than three years ago and neighborhood activists’ concerns over their impact on gentrification have sent both to the Planning Commission for additional review. In the case of 1924 Mission St., the auto body shop it would replace is vacant. The fact that the proprietors of the auto shop currently at 1900 Mission are still in business was a point of contention for the appellants, but not necessarily the Planning Commission. Instead, commissioners were concerned with the proposal’s aesthetic when it came to them for review. In their new request for review for 1924 Mission, members of Our Mission No Eviction seized on the commission’s earlier commentary on the neighboring building to make their case. Nonetheless, it’s clear that the group’s issue is not just with the design, but rather, with their fears about what the units will cost. “This high-end project proposed for 1924 Mission St. will most likely command rents of somewhere in the $3,000 to $4,000 range for a 1 bedroom unit. These rents, along with its accompanying gentrification-inducing design, intended to target higher-end tenants, will create local upward price pressure on surrounding tenants,” Bocanegra wrote in the request. The Planning Commission cannot demand more affordable housing be provided in an individual development, but can comment on design and code compliance. Once a request like this one is filed, it must hold a hearing on the project, and even then, a decision can be appealed. A hearing date has not been set. “Large windows and good lighting are only for rich people”? Are you kidding me?? I don’t understand why poor people should not be allowed to have beautiful housing! This is a very misguided attempt which will actually end up destroying the area for everyone, but especially for the working class and recent immigrants. Why do these folks want to keep the inner Mission as a slum, rather than helping people up from poverty and despair? Tighten eviction laws, strengthen rent control (for both residential and commercial property), and subsidize housing for the working poor – yes!! Try to make the neighborhood uglier, dirtier and more impoverished? No! !